Hot Wing Dip came into my life thanks to oldest daughter Megan’s friend, Jacqui. It was instant love for both of us, although Megan prefers Ranch dressing vs. Blue Cheese dressing. Either way, it’s a hearty appetizer that is great to share at a potluck, tailgate, Olympics gathering, or just because! This time I split the recipe into two 8×8″ or 9×9″ casseroles to share at different events. Hot Wing Dip has the same impact as hot wings but 1) not as messy and 2) easier to prepare. What’s not to love? Bake or steam the chicken, cool. Cut into smaller pieces. At this point you can either shred the chicken or place in a food processor to chop. Combine chicken with cream cheese, sauce, dressing and 1/2 of chopped green onions (white portion). Sprinkle top of dip with chopped green portion of onions. Place in greased 9×13″ pan. Bake at 350 degrees for 45 – 60 minutes. Serve hot with corn or tortilla chips, Ritz crackers, and celery. 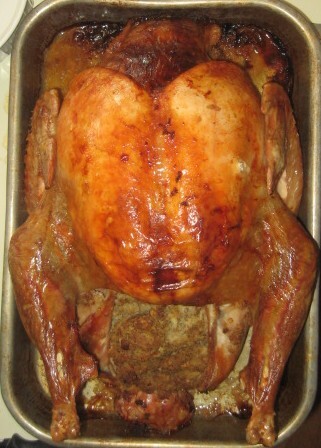 Turkey and Dressing baking the morning of Thanksgiving is such a sensory experience, bringing back fond memories of Thanksgiving past and creating new memories as well. 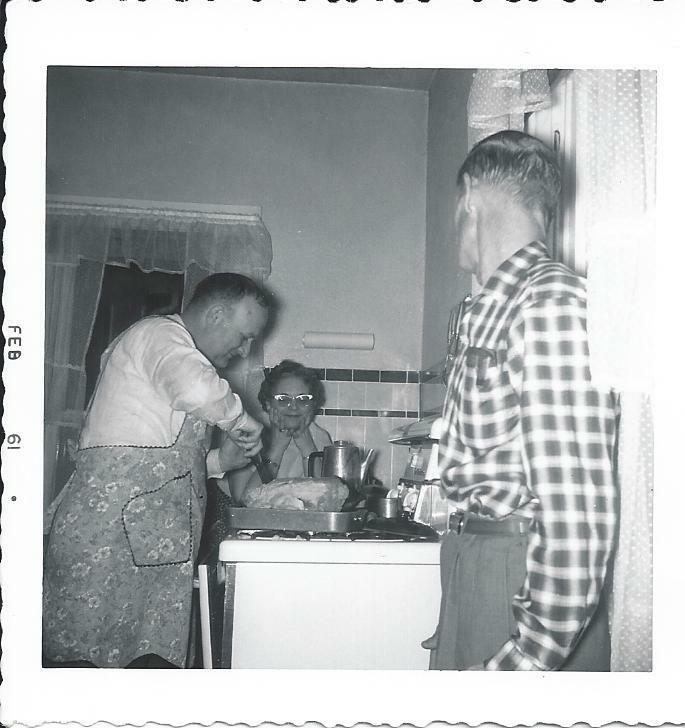 This photo of my Uncle George carving our Thanksgiving turkey in the 1960s while my Dad and Aunt Wilma watched (or snitched pieces of turkey) transported me back to the Smaha farmhouse and large family gatherings. Traditionally, my family made the dressing from only white bread. 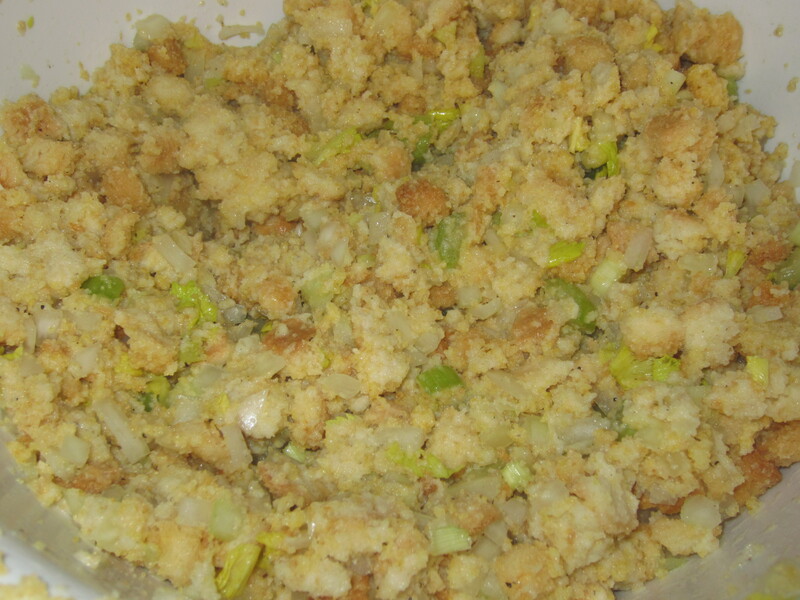 When I married, Karl introduced me to cornbread dressing and I’ve become a big fan. The texture and flavor of the cornbread are a great addition. Put bread cubes and crumbled cornbread in large bowl and saturate with broth. Add onion, egg, salt & pepper, sage & poultry seasoning. Season to taste. Add chopped celery leaves. 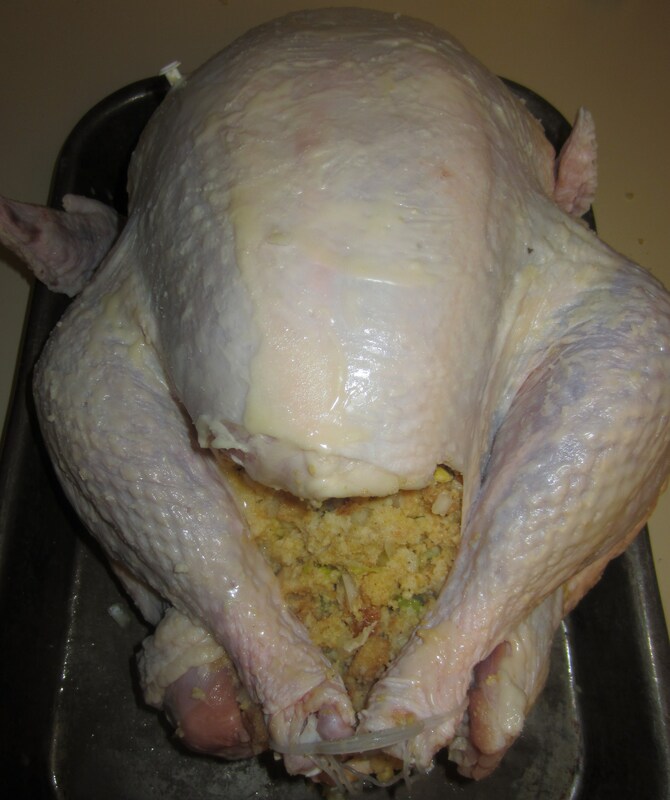 Make sure stuffing is moist! Stuff mixture in and around the turkey or chicken. Potato Salad was a must-have side dish for every picnic and barbecue. My Mother made THE BEST potato salad ever and I can replicate it pretty well. There are no measurements, just a ‘pinch of this and a pinch of that’ type of preparation. When my Mother made it, she used onions from the garden and eggs from our farm. My Potato Salad is pretty darn good, but you can never top what Mom could do! Mix together potatoes, eggs, onions (and celery if desired). Sprinkle with celery seed. In separate bowl, mix mayonnaise with enough milk to thin to consistency of salad dressing. Add sugar and salt to taste. Refrigerate for several hours before serving. The flavor is best the next day. Apple Pear Salad or is it really a Dessert??? My good friend, Jan, was telling me about her favorite Fall salad. It sounded so yummy and had all the things in it that I love. I made, I shared, I loved. This is great as a side dish but it’s so yummy, it could easily be a dessert. Thanks Jan for the great idea! Chop the above into bite sized pieces and place in bowl. Melt butter in saucepan and add brown sugar. Stir together. Add pecans and stir frequently under sugar is melted. Pour mixture over fruit mixture. Stir & serve immediately.